Farrar, Straus and Giroux (BYR), 9780374399139, 40pp. 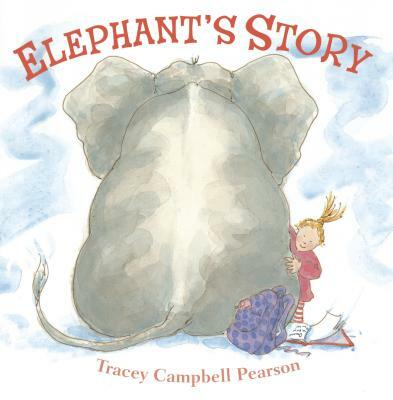 The day Gracie loses her favorite book, Elephant finds it. He sniffs the words ONCE UPON A TIME THERE WAS and--oops--they go up his trunk, where they wiggle and jiggle and make him sneeze. The letters fly through the air helter skelter, and when Elephant tries to put them back together, he can't figure out how to make the right words that fit. He asks his friends for help, but they just choose some of the letters to make up their own words--Alligator wants to CHEW them, Seal SPINs them, Monkeys THROW them, and Bear just SNOREs. Lucky for elephant, Gracie comes looking for her book. She makes the letters into the right words and then adds some of her own: a girl went to the zoo and made a new friend. When I was very small, I didn't have a special blanket or a beloved stuffed animal that was my constant companion. I had a little book that I carried with me everywhere. The Art of El Greco may seem an odd choice for a toddler, but I really loved the painting of the Cardinal in red. I thought he was Santa. I still carry a little book with me everywhere, but now it is a sketchbook that I fill with my own drawings. I was born in 1956 and grew up in Connecticut. As the youngest child, I was always trying to catch up to my older brothers and sister. It didn't work, so I spent a lot of time creating my own world in my imagination and in my drawings. My favorite place to be was in the woods, following stone walls to secret places. Twenty-five years and as many books later, it is my love of the process that keeps me creating picture books. In all of my books, rhythm and movement are important. The text and illustrations should dance together. My goal is to create a book that a child will want to read again and again, finding something new in the illustrations each time she looks at them. Every book gives me the opportunity to grow as an illustrator and author. Each story asks to be a different book. Where Does Joe Go? wanted to be horizontal with double-page spreads and color going to the edges of the paper. I worked in pen and ink and watercolor. Bob, however, needed to be a book that was big, bold, and square. I wanted the child in the back of a crowd to be able to see Bob and meow, moo, ribbet, and hop. I still used watercolor for the illustrations, but with pencil instead of ink. Myrtle is on my drawing board right now. She is as quiet as Bob is bold. Tracey Campbell Pearson has been living in Vermont with her family for twenty years. She still spends a lot of time creating her own world in her head and in her books. She shares that world with her husband, two children, a dog, and a cat. They all love walking in the woods. Except the cat: he prefers the meadow.